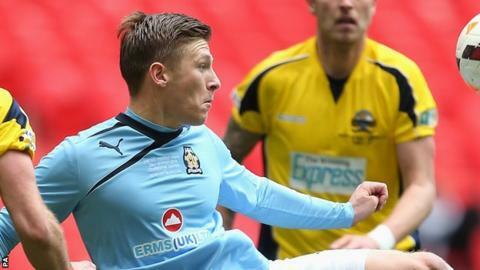 Andy Pugh's four goals kept Cambridge United's automatic promotion hopes alive after demolishing relegated Hyde. Josh Gillies headed the U's into the lead after just 54 seconds before David Poole levelled from six yards. Pugh found the back of the net twice in two minutes before Ashley Chambers added a fourth with a left-foot shot. The home side extended their lead twice more through Pugh, before Adam Thurston got a consolation and Matthew Barnes-Homer grabbed his first U's goal. Victory leaves Cambridge trailing Conference Premier leaders Luton by 10 points with four games remaining. The match was littered with defensive mistakes as boss Richard Money made seven changes to the home side's starting line-up. Pugh, who had just two goals to his name prior to the start of the match, terrorised Hyde's defence, first bursting onto a brilliant through ball from Liam Hughes and lashing the ball in with his left foot. His second was even better as he rode the challenges of two players before rounding keeper Chris Kettings and nestling the ball into the bottom left-hand corner. It took the 25-year-old just 90 seconds in the second half to complete his hat-trick as Hyde's static defence watched on as he chipped the ball over Kettings. A couple of moments later he grabbed his fourth goal after good work from Gillies, who turned a couple of defenders before sending the ball across the face of the goal, and Pugh pounced to prod the ball into the back of the net. Match ends, Cambridge United 7, Hyde FC 2. Second Half ends, Cambridge United 7, Hyde FC 2. Alex McQuade (Hyde FC) is shown the yellow card for a bad foul. Goal! Cambridge United 7, Hyde FC 2. Matthew Barnes-Homer (Cambridge United) right footed shot from the right side of the box to the bottom left corner. Assisted by Ashley Chambers. Attempt blocked. Connor Hughes (Hyde FC) right footed shot from outside the box is blocked. Attempt missed. Luke Berry (Cambridge United) left footed shot from the right side of the box misses to the left. Offside, Cambridge United. Matthew Barnes-Homer tries a through ball, but Matthew Barnes-Homer is caught offside. Substitution, Cambridge United. Greg Taylor replaces Liam Hughes. Offside, Cambridge United. Kevin Roberts tries a through ball, but Kevin Roberts is caught offside. Substitution, Hyde FC. Jake Pollard replaces David Poole because of an injury. Attempt blocked. Regan Walker (Hyde FC) right footed shot from the centre of the box is blocked. Substitution, Cambridge United. Matthew Barnes-Homer replaces Josh Gillies. Foul by Regan Walker (Hyde FC). Ashley Chambers (Cambridge United) wins a free kick. Attempt missed. Connor Hughes (Hyde FC) right footed shot from outside the box misses to the left. Nathan Arnold (Cambridge United) wins a free kick. Substitution, Hyde FC. Connor Hughes replaces Darren Thornton. Goal! Cambridge United 6, Hyde FC 2. Adam Thurston (Hyde FC) right footed shot from the centre of the box to the bottom right corner. Assisted by Jordan Clark with a cross. Attempt missed. Alex Brown (Hyde FC) right footed shot from outside the box is too high. Attempt missed. Darren Thornton (Hyde FC) left footed shot from the left side of the box misses to the left. Attempt blocked. Jordan Clark (Hyde FC) left footed shot from outside the box is blocked. Foul by Darren Thornton (Hyde FC).